Lois left a comment about having intermittent breaking of her top thread while free motion quilting on a recent post. I answered her in the comments, but wrote a good sized equivalent of a blog post. I figured I might as well re-post it for you. 1) Quality thread? Not too old? Tip: if your spool looks like the above, is Styrofoam, or gilded plastic, it's old! Not rayon (Rayon is a beautiful thread, but it takes gentle treatment and does break frequently). 2)Check your needle for snags, sized appropriately, etc. Some threads do better with a top stitch or metallic needle. Sometimes you can get a bum needle. But sometimes the bigger eye of a topstitch needle can cause sloppy stitch formation. 3) Check your stitchplate where the thread goes into the machine to form a stitch. Any snags or rough spots? Since you're going in all directions, the thread can contact a rough spot that hadn't been an issue with regular stitching. 4)Is it directional? Only happen as you stitch backwards? Happens to me sometimes. The needle can actually pierce the working thread (thread takes many passes through the machine before it is finally made into a single stitch, piercing it will break that working thread pretty quickly. Try to limit how much you stitch directly backwards, especially as that's where the needle is most prone to flexing. 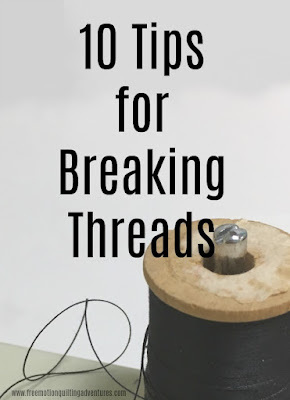 5) Thicker, rougher threads, even some quality cottons can be 'grabby' and shred if there's a lot of stitching on top of stitching (backtracking or really dense designs). 6) Sometimes it can be a timing issue- if the top thread seems to be getting split and parts are worked into a few different stitches while a ply isn't getting stitched. The hook is splitting the thread as it's being formed. Tends to happen on thicker threads or lower ply thread (2 ply vs. 3 ply). 7) Check the upper thread path. Sometimes a slippery thread can flip itself around something as you stitch, work itself out of the take up lever, etc. 8) This point wasn't in my original response. Are you also having tension issues? A too tight top tension can sometimes cause the thread to break. 9) Another tip that wasn't included earlier: Check your bobbin case for nicks, scratches, rough spots too. The top thread has to pass around the case in order to form a stitch, so it's got to be smooth and undamaged. 10) My last tip, and another one not included in my comment, is to check how the thread is unwinding from the spool. If it is a straight-wound spool, it may not like the extra twist it is being given by spooling the thread off the top. If it is a slippery thread, it may be getting tangled around the spool pin and/or benefit from a thread net. I also want to include a few more tips gleaned from working at my Janome dealer's shop part-time. Make sure you are using the proper bobbin for your machine! You would be amazed at how many machines we see whose main issue is the wrong bobbin! It's easy to grab the wrong bobbin, especially at a big-box store's sewing section or if you have had multiple machines. The machines may move on, but the accessories and bobbins tend to stay. I also recommend getting genuine bobbins from your machine's manufacturer. Ask your dealer if the bobbins you are being sold for your machine came from the manufacturer or if they are generics that fit your machine. There are generic bobbins out there with the same dimensions (or "close-enough"), but I always have less trouble with my Janome bobbins in my Janome machine. I also like buying the colored bobbins from Janome so I can separate the thread typed in my bobbins. I recently got blue bobbins and they also have pink ones. Take it from me, I buy generic everything most of the time, but not bobbins. Don't forget to raise your presser foot when threading your machine, so that the thread slides into the tension disks properly. I also raise my presser foot first when I am changing my top tension. If you have a drop-in bobbin machine, have you ever noticed that even when the case is correctly seated, there's a little bit of wiggle room? It's supposed to be there! That bit of play allows the top thread to pass around it as the stitch is formed. As you stitch, if you hear the bobbin rattle, you might have something impeding the threads path around the bobbin case. Check it for lint or debris build up. I hear this sometimes when my bobbin is running low, the tail end of the bobbin thread has come unwound a bit and is interfering with the stitch formation. If a long enough of it comes unwound, it will join the top thread in making the stitch and *whammo* the bobbin with be tied in place. Lastly, my experience has taught me that there will always be a few thread breaks occasionally. Even a long armer will have breaks occasionally. But if it's happening after stitching no more than 5 feet or so, there's probably something you can do to fix it. I was having trouble yesterday with thread breaks. I was using the correct size needle for the size of thread being used. I decided to go down a needle size to see what would happen...this combo worked and no more breaks. Sometimes you just have to play around to find what works for you. So glad I found your blog. 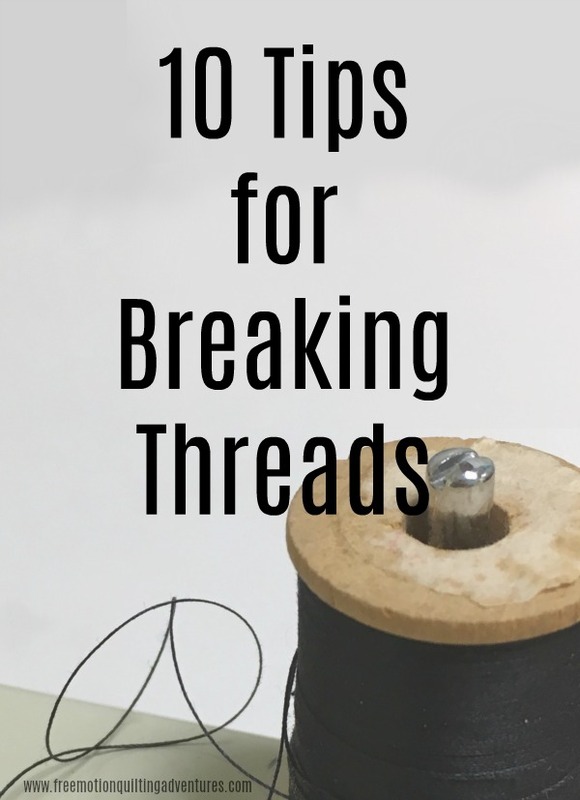 I was having problems with thread consistently shreding and breaking. I tried everything you have mentioned, different thread, needles, burrs, tension to no avail. The needle seemed to be piercing the working thread. It turned out to be the free-motion foot was riding a little bit high above the quilt surface. I adjusted it lower. No more breaking. OOH! Nola, good answer. I should have mentioned the foot height, though I don't usually have thread breakage from that, more like skipped or poorly formed stitches. But yes, that can be a factor. I'm glad you figured out your issue. Amy: I will offer another reason for thread breakage - the Bernina BSR (basic stitch regulator). This attachment is designed to make consistent stitches when free motion quilting. I fought with this thing for over a year and one of the biggest problems was thread breakage. After much research, I finally broke down and purchased the basic free motion embroidery foot (which drops the feed dogs) and my machine sews beautifully. This comment is not intended to bash Bernina - as I love my machine and it sews beautifully. Its just something with the BSR that causes a lot of issues - and many other quilters have had the same issues. I just thought your readers might be inerested in this and if they are using a BSR, I encourage them to experiment with other free motion feet. Thanks Teresa! I've no experience with Berninas so your insight is helpful. Great info. It's funny, I'm not having any issues with breaking thread but I changed my bobbin earlier today and noticed that it was making some sort of noise. It's not been messing up my stitches but now I want to open it back up and see if there's something in the bobbin case! Thanks! I can add another, from an unexpected quarter. My thread spool lies horizontally and works perfectly until the spool is nearly empty. Then the thread can catch on small rough spots on the Aurifil spool and get caught behind them. When this happened to me the first sign was "eyelashing" on the top, usually a tension issue but I was towards the end of a bed quilt without tension issues. Rethreading, and cleaning didn't help: the thread broke again after an inch of stitching! Then I noticed that the thread wasn't drooping but pulled tight leaving the spool. I solved it by using the vertical spool holder until I'd finished that quilt, and then winding the rest onto bobbins. I've noticed all Aurifil spools are not perfectly smooth on the ends. I finally figured out to change the thread from the vertical feed to the horizontal feed today on my Bernina 440 QE. The spool was almost done but the thread started wrapping around the take up lever (I'm not sure if that's what you call it). I never have had a problem with this thread for piecing but the change worked today.